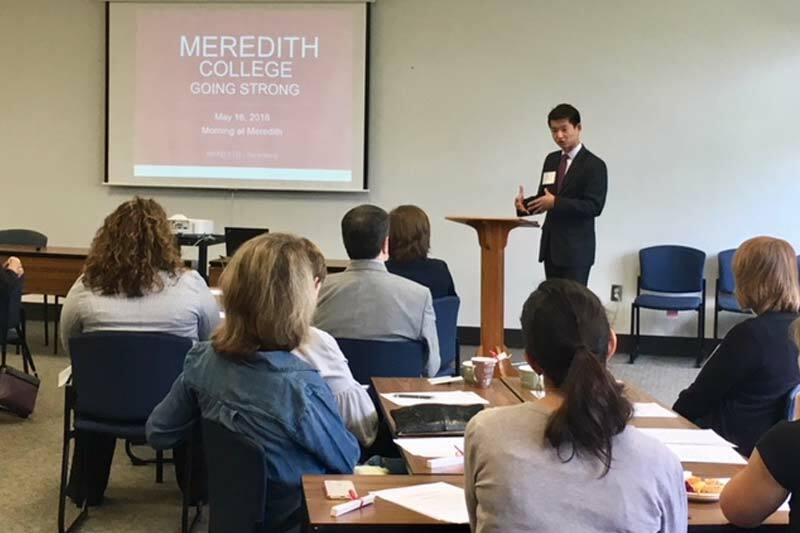 On May 16, 2018, the Office of Career Planning hosted the second annual “Morning at Meredith,” an opportunity for faculty, employer partners, and the career planning team to connect, share valuable information, and inform efforts to professionally prepare Meredith students for the workplace. Employers attending included Credit Suisse, MetLife, BB&T, Blue Cross Blue Shield NC, Northwestern Mutual, Allscripts, Bioagilytix, Enterprise, FHI360, the State Government Internship Program, Syneos Health,​ and​ Bright Horizons. Meredith College deans, faculty, and staff also attended the event. The keynote speaker was Christopher Chung, CEO of the Economic Development Partnership of North Carolina, who discussed current economic development trends in our state. Gina Wilner, associate director of admissions at Meredith, provided an enrollment overview to inform attendees about the makeup of Meredith’s student body and alumnae. Following the speakers, attendees participated in roundtable discussions using a list of “Career Readiness Competencies” from the National Association of Colleges and Employers (NACE) as a starting point. Such competencies include critical thinking, teamwork/collaboration, and global/intercultural fluency, and are associated with career readiness for new college graduates. Faculty heard from employers regarding the skills students need for the workplace. Takeaways from the conversations included the importance of exhibiting confidence and courage and the willingness to speak out when employees see something wrong; knowing how to dress and communicate professionally; and understanding and being able to navigate differences in cultures and backgrounds. According to Assistant Director of Employer Relations Jane Matthews, the interaction with employer partners is incredibly valuable. “Hearing from employers on what career readiness looks like for their organizations helps to shape the messages we share with students and recent graduates,” said Matthews. “When we continue to build relationships and connections between our staff, faculty, and employers, we are able to develop more opportunities for our students." Candace Dudley, internship and youth council coordinator for the NC Council for Women and Youth Involvement with the State of North Carolina, said she encourages interns to share their ideas, even though they are “just” interns. “State government can be a little antiquated, and these students are coming in with brand new knowledge and skills,” said Dudley. Sue Steinmetz, vice president for global markets technology, said she is consistently impressed by Meredith students who intern for and are hired by her company, Credit Suisse. Matthews observed that the collaborative nature of the event is essential.